Most of Canada's premium and high end cards have great benefits beyond earning points and providing extensive insurance packages. One type of benefit that many of the cards touch upon is dining and a card that has put a lot of focus into dining recently is The Platinum Card from American Express. They have partnered with a host of amazing restaurants across Canada that when you dine at participating locations you'll typically get a nice little bonus on top of your meal. It could be a glass of wine or champagne, an amuse-bouche or even a dessert. As long as you reserve via the Platinum Concierge you'll receive the benefit as outlined in the Amex Platinum Dining Program Guide. Remember to take advantage of the benefits of the Platinum Dining Program you must make reservations for the restaurant(s) of your choice via the Platinum Concierge. You can earn 1 Membership Rewards point (“point”), in addition to your standard earn rate of 1.25 points for every $1 spent on eligible purchases made between July 10, 2017 and September 30, 2017 at restaurants participating in the Taste from Platinum Dining Program. An eligible purchase is any purchase over $1 charged to the Platinum Card at participating restaurants between July 10, 2017 and September 30, 2017. 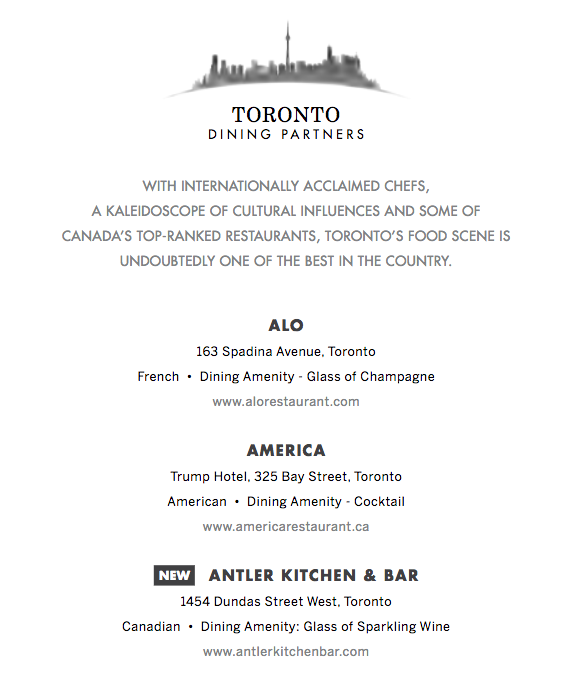 Restaurants eligible for the offer are those listed in the enclosed 2017 Taste from Platinum Dining Guide, current as of June 6, 2017. Participating restaurants can change at any time. Don't have The Platinum Card from American Express? 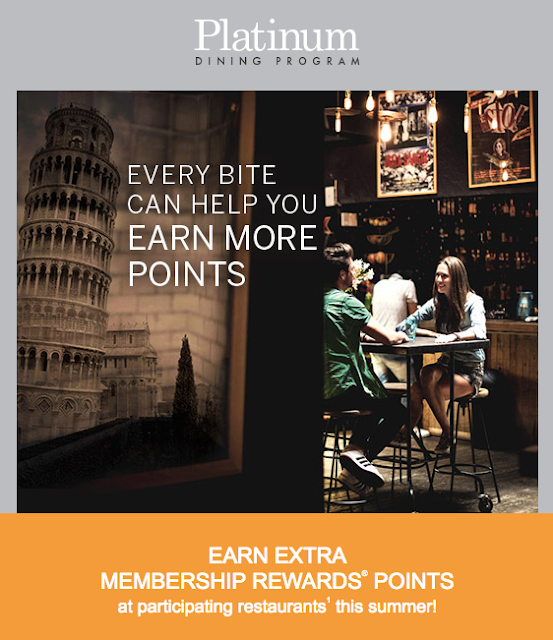 You still have lots of time to grab it and start taking advantage of it at any of the restaurants in the guide to earn the extra points. Not to mention you'll get all of the other benefits that come along with the card! Lounge access, hotel elite status, Fine Hotels & Resorts and much more. Have you gone out to eat at any of the restaurants in the Dining Program? Have you enjoyed the amenities and have you seen any of the bonus points post yet? Let us know in the comments below!